Competition is good! Competition is bad! At some point in every leader’s careers he or she will have to decide whether or not to use competition to motivate staff. Some people swear by competition and use it as often as possible. They see it as focusing staff and creating a game-like, fun environment in the workplace. Others feel competition is bad and avoid it all costs. They do not like a win-lose situation between staff members. 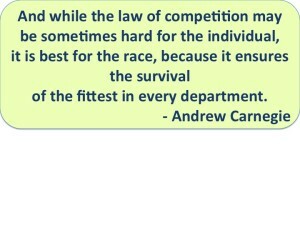 Most leaders feel competition is situational. It has times when it can be of great value and other times when it can create great damage. If this is true, when and how is competition effective? What are the keys to making competition work effectively? There are two aspects of workplace competition. 1. Competition between employees or work teams. 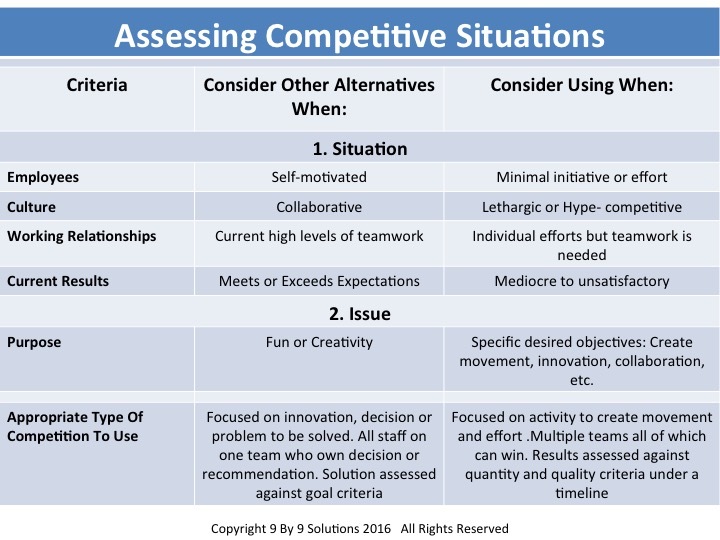 Consider the following research on using competition between employees. “Winning a competition makes people more likely to behave dishonestly at a later time. In five studies, researchers found that winning a competition increased the winners’ likelihood of stealing money from their counterparts in a subsequent unrelated task. The findings indicate that success is multifaceted: Dishonesty increased when winning was due to performing better than others, but not when success was determined by chance or in reference to a personal or set goal. Researchers say a possible cause is an enhanced sense of entitlement among competition winners. Ben-Gurion University and The Hebrew University of Jerusalem). 2. Competition with other providers of the same service. In the research paper, Customer-Driven Misconduct: How Competition Corrupts Business Practices, the researchers suggest that many organizations in highly competitive markets are likely to bend the rules if doing so will keep their customers from leaving for a rival firm. The study shows that owners of vehicles that fail an emissions test are 11% less likely to return to that facility the following year, which implies that those same customers are also less likely to use that business for future repairs and routine service. Hence, testing facilities have ample incentive to exhibit leniency, meaning, they manipulate the testing equipment or find other ways to pass vehicles that should fail to keep their customers loyal. So it’s no surprise that the emissions testing industry is fraught with fraud all over the country. Managers should be aware that fostering a culture of intense competition, in an honest attempt to motivate employees, might instead induce unethical behavior. These studies demonstrate the dangers when staff compete. First, if winning the competition becomes more important than working with others complying with mandatory requirements then the end result will be unhealthy. Second if winning a competition means some will feel superior and therefore more deserving than others then the end result will be unhealthy. When this leads to entitlement and even dishonesty, as indicated by the research above, then the leader will have created more problems than he or she solved. Finally, The leader should also recognize that just like with any motivational technique, not all staff will respond effectively to competitive situations. According to research cited in Top Dog: The Science of Winning and Losing about 25% of people are unaffected by competition; 25% wilt in a competitive environment; and 50% benefit from competition. Is Competition Right For My Situation? 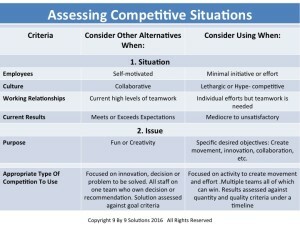 Before a leader uses competition as a workplace motivational technique he or she should assess the situation to see if a competitive situation makes sense. First, the leader should assess the organizational culture. 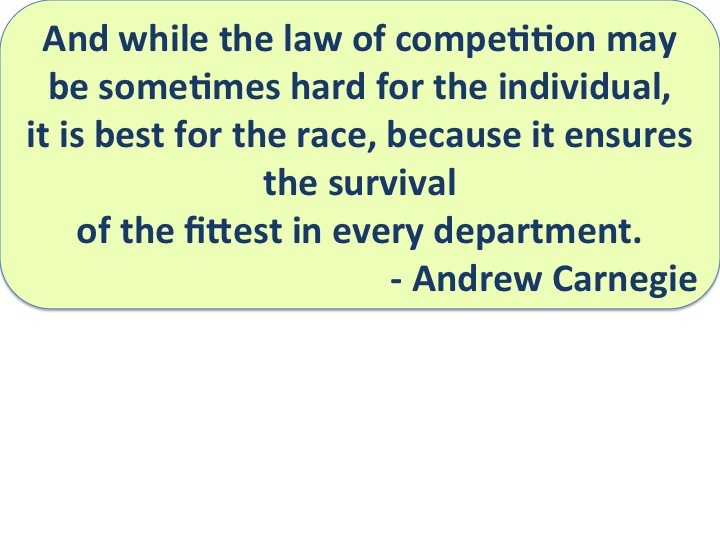 If the people are already extremely competitive then adding to that culture with additional competitive situations may only push the organization into a very unhealthy hyper-competitive state. However, if an organization is lethargic and demonstrates little energy, effort or urgency toward achieving goals, then short-term competitive situations may serve as a way to overcome this inertia. 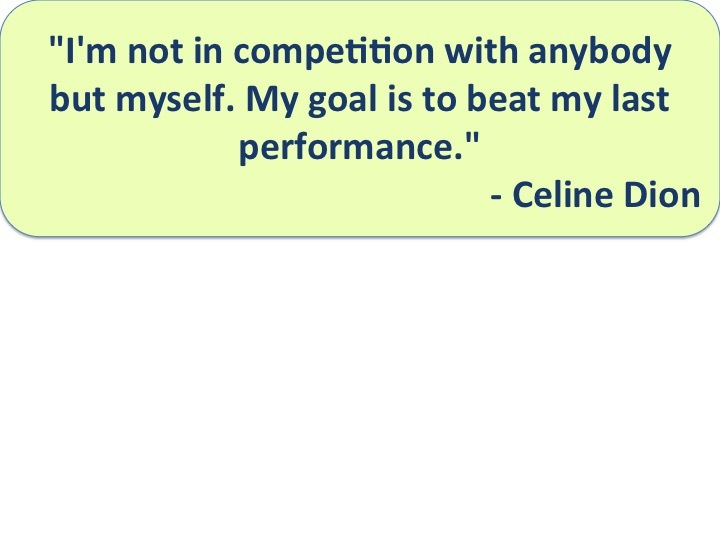 Finally, if the leader sees people who are already giving their best and striving for excellence then adding an overlay of competition may actually damage the self-motivation that exists. Third, treat the decision to use competition as a decision analysis. The leader must define what he or she wants to achieve. If there are not good reasons to be achieved, do not use competitions. If there are valid reasons, then assess any risks in achieving those objectives. Finally consider if there are other alternatives that would achieve these desired purposes and minimize the risks better than a competitive situation. If Competition Is Appropriate, How Do I Use It Successfully? 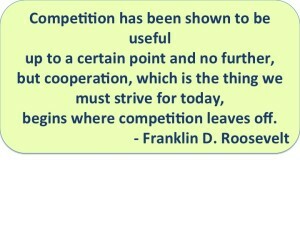 When competition is used there are two key actions to create success. First, structure the situation where individuals or teams compete against goals or standards, not each other. 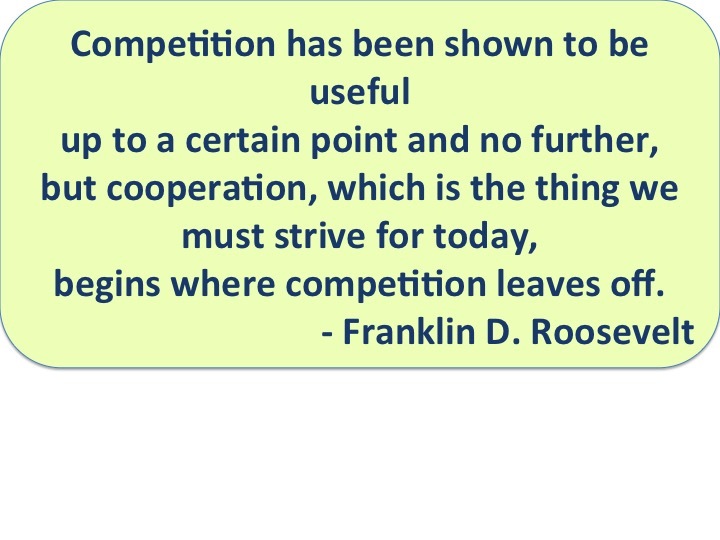 If competitions pit individuals against each other (so there in only one winner – individual or team), then this competition may result in a lack of cooperation, sharing of information and possibly sabotage. If game playing is necessary to win the competition, then the leader, the organization will have lost because staff will believe the competition was unfair. As mentioned above, if the workplace becomes hyper-competitive, then every action will be contested and rules of the game will become more important than the results achieved. As a result, success (and even credit) for results accomplished will be contested. Second, structure the situation so that the competition rewards collaboration and teamwork on the way to achieving results. Competition often results in situations where one highly motivated overachiever does all the work him or herself. An overachiever is usually not willing to lose (it’s in their genes!). If the overachiever does not respect the capability, efforts or even urgency of other team members, he or she decide to do whatever is necessary to win. As a result, other team members will not be involved and maybe turned off by the competition even though an acceptable or even a great result may have been achieved. 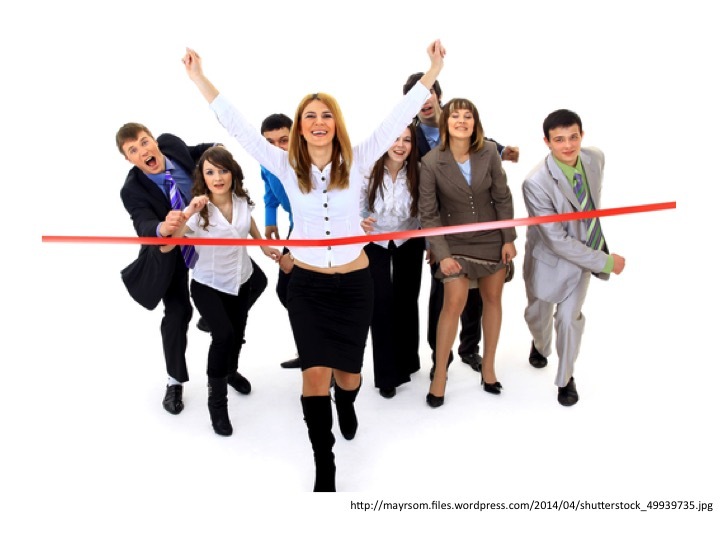 By setting up competitions that encourage positive interactions between team members and where win-win situations are created, the leader develops behaviors that can be replicated. The important point to remember is that even if competition is appropriate for the situation, the result will not be healthy if the competition is structured poorly. The most important leadership skills to make competition work are setting meaningful goals and structuring the competition to achieve the desired results. By defining what success looks like, the leader clarifies how the final products will be assessed. (If it this is only a number or dollar amount, then the leader probably has not structured the competition properly.) By structuring the competition to require participation and involvement of all team members, the leader addresses and minimizes the unhealthy aspects of competition. Finally, if the purpose of the competition is being used to build momentum, initiative, energy or confidence, the leader should consider linking a series of these short-terms competitions toward a longer-term goal. In this way the leader creates a series of short-term wins that build both momentum and confidence and which provides visible indicators that progress is being made in the desired direction.